The new meets the old…. Everybody should know Dwaas by now (and if not; welcome to Foolish Lego 🙂 ). The one on the right is ‘Baby’. Yes you read that right, his name is ‘Baby’. The way he got his name is a long story. This is the Minifigure from my youth. As a little kid I carried him around everywhere (as you can see). I was heartbroken when I thought I lost him once. He played a role in all the Lego play-situations, he was always the hero, superman, astronaut (hence the helmet (with the crack in the middle like Lego-Benny had), inventor, etc.. First he had the helmet, later on the hair came. It is instantly recognizable by the light spot on the side. I still use it in the comic as the hair of Barry. He originated from a book I got when I was six years old, the “6000 Lego ideas book“. I used the sticker in there, which was red with white stripes, when it faded beyond recognition I took a marker and made myself a new white sticker with red stripes, when that one faded too… I left it. Since I was six, he’s always been around, even in the dark ages. These days he has a special place where I keep him, safe from loosing him. This is the story of Baby in a very, very small nutt-shell. Dwaas comes from a completely different place. There is story behind him, his appearance and his name too… a story that makes Dwaas older than he really is… but that’s for another time. 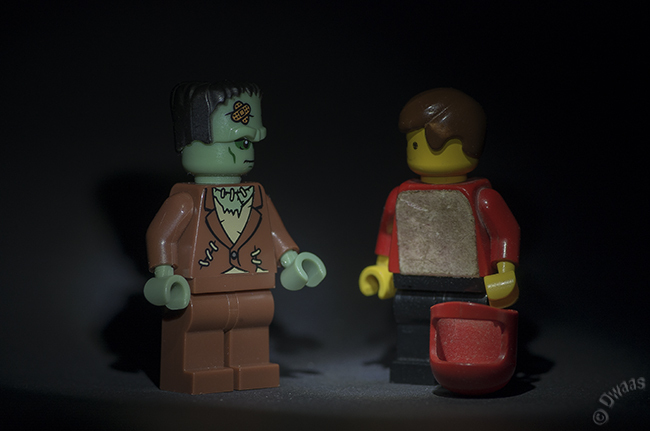 And HERE’s the latest episode of the Foolish Lego webcomic, episode 144! Both should have a lot to say about you! My dad had that book!